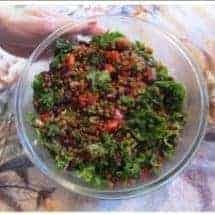 My forum-friend Ruth made this wonderful salad and posted pictures to tease us with. Looks delicious, doesn’t it? Rinse wheat berries. Combine with 8 cups water in a medium pot. Bring to boil, then reduce heat to medium high. Cook covered for 30-35 minutes. Stir in cranberries during the last 2 minutes of cooking. Drain and rinse in cold water. Whisk oil with vinegar and salt in a large bowl. Season with fresh pepper. Stir in wheat berry mixture, kale, onions and red/yellow pepper. Serve immediately. Keeps well left over in the refrigerator for 1 day. Add cooked diced chicken, or chick peas bacon. Doing so will give you a complete protein.